Originally published by Amazon Watch. Written by Christian Poirier. We don’t agree with many views of the nonprofit organization Amazon Watch. We don’t believe in corporate accountability or green capitalism. 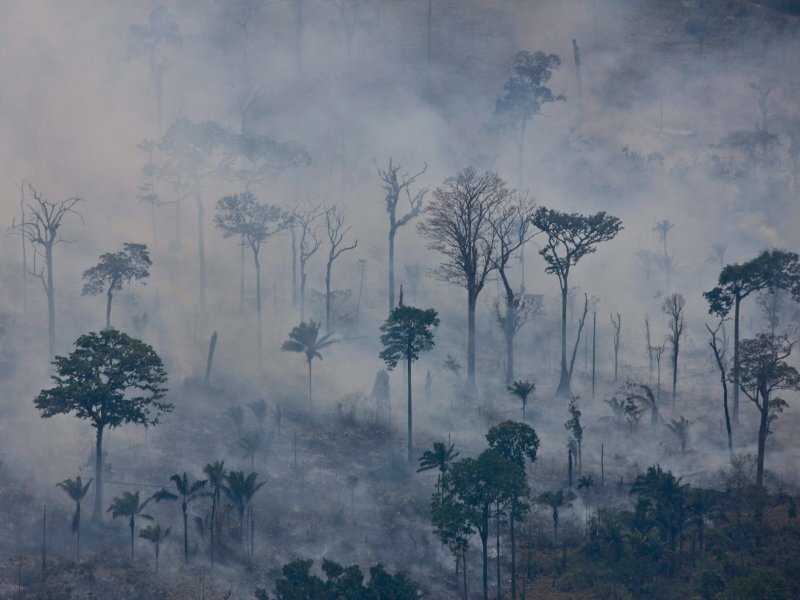 We consider capitalism as the root of the two problems that Bolsonaro’s election will bring: Fascism and environmental destruction. We decided to re-publish the article below because even when we don’t share some of the views of Amazon Watch, we think it’s an important read . Some of the Enough is Enough team, November 1, 2018. The extreme right-wing candidate Jair Bolsonaro was elected Brazil’s president on Sunday in a victory that hands him a powerful mandate to enact a series of sweeping changes to the country’s political, economic, social, and environmental order. His victory represents a profound setback for human rights and ecological preservation in the world’s fourth largest democracy, with implications for the entire planet, particularly global climate stability. President-elect Bolsonaro’s reckless plans to industrialize the Amazon in concert with Brazilian and international agribusiness and mining interests would bring untold destruction to the planet’s largest rainforest and the communities who call it home. Bolsonaro campaigned on proposals to drastically curtail the enforcement of Brazil’s protections upon forests and recognition of human rights standards such as indigenous land rights. If realized, these rollbacks would have far-reaching implications for the climate and the treatment of Brazil’s minority groups. Bolsonaro didn’t even need be elected to endanger the Amazon: a so-called “Bolsonaro effect” increased Amazon deforestation by 36% during the electoral period, according to official statistics. “Bolsonaro has made clear and consistent declarations about ending the titling of indigenous lands, which are completely opposed to our rights. His racist, homophobic, misogynist, fascist discourse shows how Brazilian politics will be in the coming years,” declared Dinamã Tuxá, Coordinator of Brazil’s Association of Indigenous Peoples (APIB). Dinamã’s fears of violence have proven prescient. In the days surrounding Sunday’s election, a wave of violence led by pro-Bolsonaro forces gripped indigenous territories, providing a grim signal of the upheaval that is to come. In Mato Grosso do Sul (MS) State, a militia burned a Guaraní-Kaiowá village to the ground, wounding fifteen people including a nine-year-old child. In Pernambuco State, a school and health clinic belonging to the Pankaruru people were destroyed. Also in MS, gunmen attacked an encampment of Brazil’s Landless Workers Movement, setting fire to a home. Bolsonaro has clearly signaled that his administration’s policies will be tailored to the needs of the agribusiness and mining sectors, which are vying to expand their operations into the Brazilian Amazon’s protected areas and consolidate control in other regions. This week’s reaffirmation that his government will dissolve the Environmental Ministry into the Ministry of Agriculture further demonstrates how environmental stewardship will be scorned under a Bolsonaro regime. Meanwhile, Bolsonaro’s rhetoric indicates that his government will reward and empower some of Brazil’s most conservative and virulently anti-indigenous ruralista leaders with high government posts. Furthermore, his proposals to ease firearm possession will serve the interests of large landowners and empower land grabbers and rural mafias, who will increasingly operate with impunity. As a result, spiking violence will fall disproportionately on environmental and human rights defenders, whose existence is already under serious threat. “For us indigenous peoples this election represents a continuity of our struggle, and it encourages us to do what we have always done in defense of democracy and our rights. Today, these rights appear more threatened in every space, from our villages to the cities to our institutions,” affirmed Luiz Eloy Terena, lawyer for APIB. In this spirit, Amazon Watch will redouble its work in solidarity with our embattled partners – from remote communities in the Brazilian Amazon to the country’s national organizations – to push back against Jair Bolsonaro’s retrograde and destructive agenda. Previous post: #NoBorders #Gap, France: Call for mobilization! – Solidarity is not a crime! Next post: The rise of fascism and the growing climate disaster: When are we going to realize that capitalism will kill us all?